Focus of this article is on Tithi (the jala tatwa or water element). 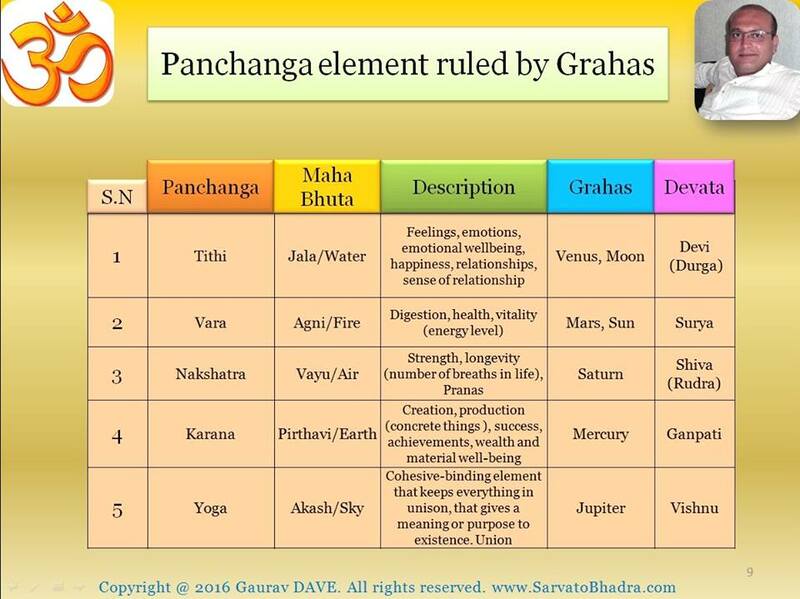 Among the 5 elements of time (panchanga), the [Tithi, the vedic date] is jal tatwa (watery) by nature and rules our feelings, emotions, happiness and all our Relationships. 1. Agni, fire element : immense energy in creating the relationship and to some extent maintaining it in short term but the gradually all the emotions get dried up and dryness prevails, in short bad in long term. Quest of spirituality and/or idealism in all the relationships. 2. Prithavi, earth element: the relationships are contained and governed by worldly rules of mutual benefits or worldly favors/give and take etc. 3. Vayu, air element: the stability of the relationships is at stake. They keep on changing with time. Sometimes they get transported to different planes but still remain vague. 4. Jala, water element: emotions in full flow, the native tries to care and nurture the relationship with great emotions and love. Person respects the essence of all relationships and hence mixes up his/heart. In addition to this, the Naisargik Tatwa (the element represented by the planet) should be considered, for example: Venus and Moon are jal tatwa, so inherently they will contribute in favor of fruitful relationships. Also the tatwa of planets having Yogas and Rashi Drishti on/with the Tithi lord should be considered in The order to give fine results.